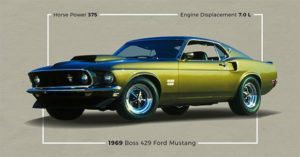 Muscle cars and power are featured in this opinion article submitted by Spinny.com. 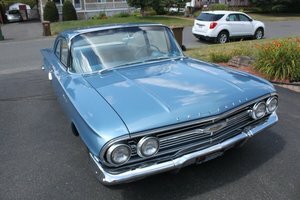 And, for your car shopping convenience, please see the links provided to these muscle cars currently for sale on OldCarOnline.com. Killer looks, heavy engine and a handful of units make the Boss 429 Mustang arguably one of the most valued muscle cars to date. 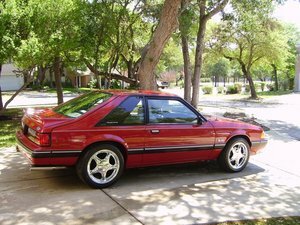 In compliance with NASCAR’s homologation rules, Ford made the Mustang the house of its new Hemi engine. Other than the brawny hood scoop and bulging fender, the car looks quite tamed and smooth for a muscle car, although the bulging tires reinforce its macho image. Limited production by Ford makes the Boss priced heavily around $417,000 depending on the auction. Backed with 450 lb/ft of torque and 375 horsepower, which would easily cross 500 in actual output, the Boss is a muscle car which has no parallels. Ford transformed its V8 engine into a 7 litre four-barrel with an aluminium high-riser, outputted by large exhaust ports, earning the nickname ‘Shotgun engine’. An oil cooler, beefed suspension with front and rear stabilizer bars, and power front discs rounds out the hardware, which boasts a staggering 5.3 seconds from 0-100 kph. Evident reason for it to be the costliest non-Shelby made by Ford. The Chevrolet Camaro’s V8 6.5L engine was upgraded to 7.0L to what the company called the ZL1. This would become the core of the COPO (Central Office Production Order) variant of the Camaro, built specifically for the purpose of drag racing in the USA. 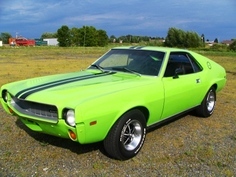 Borrowing the lean, wide hood design from its Camaro predecessors, with the addition of sport stripes on the body and black, lush interiors, the 1969 Camaro gained popularity not only as a car for teenagers indulging in drag racing, but also as a family car made for every man and woman. At the Scottsdale auction in 2012, it was priced at $451,000. The wide tires and iconic hood are graced by a 426 cu in. (7.0L) big-block, four-barrel engine which had wet-sump lubrication, transistorized ignition system and accommodations for a mechanical fuel pump. 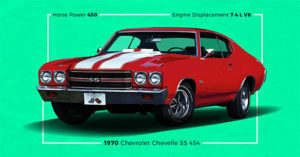 Managing around 500 honest horsepower and a heavy torque of 380lb/ft, it was the most powerful engine General Motors offered to the public, clocking 0-100 in 7.2 seconds. Relatively, a ZL1 is a 396 SS body with better suspension, cowl-induction hood and heavy duty front springs and brakes. Probably the most famous car in the United States, owing to its appearance in the cult racing movies series “Fast & Furious” & the hit American TV show “Dukes of Hazzard”, the Dodge Charger R/T (Road/Track), with its easily recognisable divided headlight grille was one of the meanest looking muscle cars back in the late 60’s and 70’s. The SE (Special Edition) added leather to the front seats, a wood grain steering wheel and instrument panel. 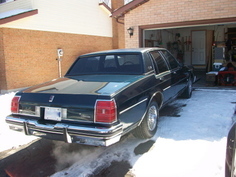 The tail was modified from prior Dodge into something more elongated, giving the car a leaner look. The factory price for a Dodge Charger R/T in 1969 was nearly $3,600. In modern times, however, it has been auctioned around $60,000. The Charger R/T boasts a 440 cu. in., 7 litre, four-barrel Magnum V8 engine that produced around 380 horsepower with an engine option in the form of the 426 Hemi which cranked up 425 horsepower, clocking 0-100 km/hr at 6.2 seconds. While other muscle cars at the time came out either with a more dynamic profile or a more powerful engine, it was hard to compete with the Charger R/T in terms of the complete deal. 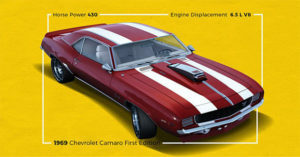 The layman would easily term the Camaro as Chevrolet’s prime muscle car but enthusiasts would understand the inclusion of the company’s go-to muscle car prior to Camaro in this list, a Chenille. A racy hood with two wide and long white stripes running its length combined with black polished grille, resilient rear-bumper and brawny tires on sport wheels made it a sight to behold. This particular unit is sold at around $38,000 now. It was ridiculous how powerful the Chevelle SS 454 is. 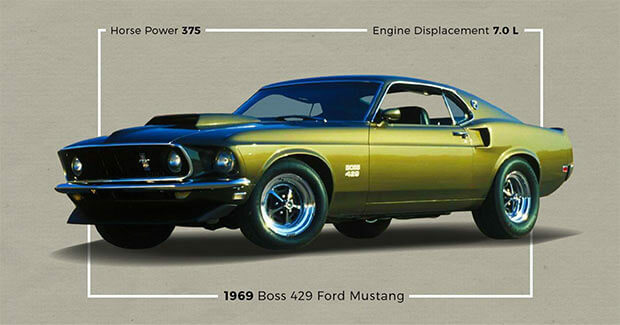 It was one of the most powerful muscle cars ever built for its time. Under the hood was a huge 7.4 litre big-block V8 Chevy engine that produced an impressive 0-100 kmh time of 6 seconds. The four-barrel carburetor churned out a massive horsepower of 450 and 500 lb/ft of torque, statistics which are most definitely understated. 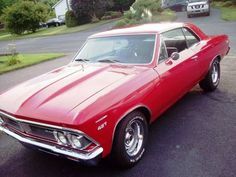 Although overshadowed by its successor, those who have had the pleasure of owning the Chevelle SS 454 would agree with Chevelle’s claim as the once official muscle car of Chevrolet. The Hemi Cuda was more than a muscle car for Plymouth. Its introduction meant Plymouth Barracuda breaking its image as an economy car, upgrading both its interior and exterior design and most importantly, its engine. 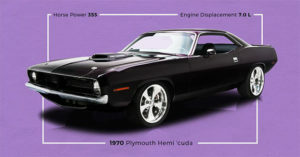 The Hemi Cuda became the flagship car of Plymouth because it became Plymouth’s bold answer to the likes of Camaro and Mustang. The car is slightly more settled down compared to its competitors and sports a divided grille cornered by spherical headlights. It certainly is the most valuable car made by the company, being recently sold off at auctions at prices as high as $4 million. The Hemi Cuda boasts of a V8, dual carburettor, whooping 426 cu in. engine which clocks a 0-100 kmh time of 5.8 seconds and churns out a 425 horsepower. The torque produced is commendable at 490 lb/ft. The car’s sunken suspension was tailor made for heavy acceleration, although the heavy front end gave slight troubles in handling. But nothing stopped the car from becoming a valid competitor at the peak of the muscle car era. 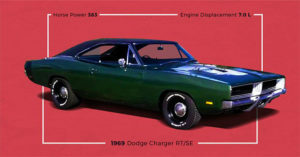 Like the Hemi Cuda, the Charger’s cousin was conceptualized in late 60’s to compete with the likes of Camaro and Mustang but was released a little too late and ended up in direct competition with the Hemi Cuda at the peak of the muscle car era. The Challenger’s towering dimensions gave it an amalgamation of a sporty and muscular look. The hood sported a raised platform for release and twin headlights covering a snazzy grille. Inside, the car looked appealing in its leather seats and extensive wheelbase which gave more interior space. 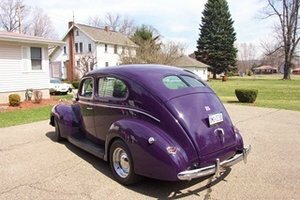 Recent auctions and sales have had the car priced at $95,000. Backed up by a giant 440 cu in. (7.2 litre) hemi engine, the car could easily produce 425 horsepower and a torque of 398 lb/ft. The Challenger produces 0-100 kmh time of approximately 6 seconds. 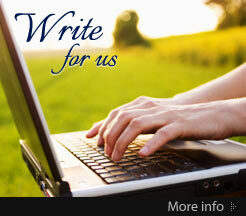 It featured in the existentialist film Vanishing Point in 1971. Dodge had every option available for customers, including the factory sunroof, which was a rarity at the time. 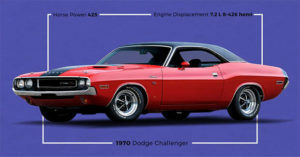 The company would later decide to tone down the Challengers succeeding the 1970 one, leading to a decline in interest. Based on the Shelby GT500, the KR, which stands for “The King of the Road” was introduced by Ford in the middle of the year. Evidence for the initials can be backed up in the following quote by Car Life magazine: “The car is so impressive, so intimidating to challengers, that there are no challengers”. Ford asked for assistance from Carroll Shelby and Shelby American modified the car extensively, extending the front end of the hood by three inches which emphasized its powerful look. In addition to this, dual front scoops and hot air vents were added to the hood. Larger brakes and rigid rear shocks were more plus points. The hood, tail, front and rear ends were manufactured out of fiber glass. The interior didn’t have many modifications from Shelby except for the wood-rimmed steering wheel. At the time of production, the ’68 Shelby was priced at $5,422. The engine was modified into the single four-barrel carburetor Cobra Jet 428 V-8, mated to an automatic transmission, which was rated at 335 horsepower but easily gave away more than 400. Enough to zip the car from 0 to 100 kph in 6.9 seconds. 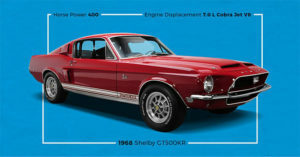 The car would go down in history as Mustang’s evolution resulting from both Shelby’s and Ford’s innovation practices. Spinny aims to alienate the grievances and lack of transparency plaguing the used car market. It is an online used car marketplace which provides customers with cars which are comprehensively inspected across 200 checkpoints. Buy used cars from Spinny in order to protect yourself from car fraud. Those cars are just beauty within a beast. Really an informative blog. Thanks a lot.